Overall impression of José Andrés? He is a wonderfully animated man and I really, really enjoyed his lecture. Dave hosted the lecture last night. I missed last week, but apparently the Recipe of the Week was aioli (last week’s theme was emulsions). Tonight, the theme was “gelation and spherification” and the Recipe of the Week was spherification (I think the students will be working with pea soup as the liquid but I’m not totally sure). José started with a slideshow of the history of gelation: the Egyptians used animal glue for building; the Irish have been using carragheen (aka carraghen) since the 14th century; the first recorded use of agar agar was in 1658 in Japan. Then we got into more modern examples of gelation: canning as a military discovery in France in 1810, gel caps for swallowing medicine in 1833 and, of course, finally Jell-O which was patented in 1845 but did not start to see success until starting in 1902 (talk about a study into marketing tactics). But there are lots of different ingredients that you can use for gelation/spherification: pectin, methyl cellulose, gellan (made from bacteria! ), carragheens like iota and kappa (seaweed), agar agar (seaweed again), and alginate. Once a chef comes up with a dish, he/she will have to test out different ingredients or combination of ingredients to find the best result. After the slideshow, he showed short movies of recipes. The first was a clementine sorbet with pumpkin seed oil and clementine sauce. Clementines were blanched. Then they were cooked in syrup via sous-vide. Once done, you could carefully slice a small X into the bottom of the clementines and remove individual segments of fruit without disturbing the clementine skin any further. The clementine meat was eventually made into a sorbet and piped back into the skins while pumpkin seeds were caramelized twice. Plate and serve. The next recipe movie was for strawberry mousse. The third recipe video, I must admit, is one that I would love to try: coconut steam bun! José took a short break from the videos to explain a bit about minibar, one of his restaurants. Like Grant Achatz’s Alinea, minibar serves many tasting dishes (I believe it’s 36 dishes) but José makes sure that each dish only focuses on one main ingredient. Whereas Alinea wants to provide a dining experience on all the senses, minibar has a more simplified approach. The next video was feta ravioli with turkish tomatoes. Feta brine, water, gellan, and agar agar are boiled together. The mix is spread thinly on a tray with the excess mix poured off. When it’s cooled, it becomes a clear skin that is feta-flavored. This is cut out into precise rounds, filled with feta, and then folded to make our feta-raviloi. The Turkish tomatoes (which are small) are carmalized and served on the side of the ravioli. Instead of a video, next José explained the image of his deconstructed white wine which was being displayed on the screens between videos. Wines are often described with images or flavors of other things. For example, to quote a random wine website, “Chardonnay wines are… with rich citrus (lemon, grapefruit) flavors. Fermenting in new oak barrels adds a buttery tone (vanilla, toast, coconut, toffee).” José picked out the edible flavors in the description of a white wine. He made a white wine gel and then top around the edge of the gel those edible flavor ingredients used to describe said white wine. So, maybe a chardonnay gel would have lemon zest, grapefruit zest, vanilla, toast, coconut and toffee carefully laid out. When served, you’d be instructed to eat a bit of gel with one ingredient at a time, and then move around like hands on a clock. He showed us a video of cheese egg (looks like an egg but it’s an egg yolk surrounded by gelled Parmesan cheese water), followed by a video of lemon chicken (lemon syrup with agar agar is made into lemon caviar – the lemon caviar is then dressed with a chicken demi-glace sauce and served in a crispy chicken skin, topped with rosemary foam). The last video was corn on the cob. Corn juice and agar agar are mixed and used to fill fat straws. In the meantime water and methyl cellulose are boiled together. Baby corn kernels are mixed into the methyl cellulose base, and spread thinly. This spread is used to fold over the corn juice core, and shaped into baby corns. Dress and serve. So, you get a baby corn that’s not quite the baby corn it started out as. To end the lecture, José launched into a serious discussion on hunger issues (he is specializing in cooking methods against hunger). Recently, he’s been working with solar kitchens in Haiti. Food relief doesn’t just mean giving free food to those who need it. We need to be more self-conscious about giving because it can also mean the chance to support local farming and local business. The greater good would be to make sure that people are cooking the food they buy locally which in turn supports their community. Food relief is connected to economic issues. It’s connected to environmental issues. By finding other methods of cooking (removing charcoal as a cooking source and any other environmentally harming sources), we can help our society. José is in the middle of developing black pressure cookers to be used in a solar kitchen (in his developing trials, he’s able to boil two gallons of water in 40 minutes) and, if all goes well, it sounds like they will be manufactured by Fagor (the leading appliance manufacturer in Spain). I wish him much luck in this endeavor. All in all, the night was a fun, tantalizing, and thought-provoking. A huge thank you to José Andrés for coming to Harvard University to talk to us about cooking. For example, temperature contrast. One of the dishes served at Alinea starts with a bowl of paraffin wax made in the kitchen. Cold potato (or was it pea?) soup and hot potato gnocchi-like but spherical dumplings are prepared separately. A pin is inserted to the wall of the wax bowl and until the beginning of the pin has gone through the wall completely. The cold soup fills the wax bowl; some soup ingredients are skewered on the pin; and the hot potato dumpling is suspended at the end of the pin. Upon serving, the guest is instructed to pull the pin out so that all ingredients drop into the bowl and then slurp the whole thing back. The point? It’s a way to serve something cold and something hot at the exact same instant. Then, we got to play with the brown flaky substance that came in our take-out box. What was it? Dry caramel! Grant and his assistant demonstrated this live. You place caramel, which is normally sticky and chewy, in a food processor with tapioca maltodextrin and give it a whirl. When you’re done, the caramel has become a powder, light and fluffy, the complete textural opposite of normal caramel. Upon getting rehydrated (ie saliva in our mouth), the caramel turns back into its original form. Grant does the same texture play with salad. Traditionally, salad is meant to be a palette cleanser after a meal and before dessert. But salad requires a lot of chewing and Grant thinks a palette cleanser should disappear in our mouths. So, his kitchen juices salad greens, seasons with salt and pepper, and freezes it. The salad is then forked up like a granita and served. And like granita, it melts in your mouth until it disappears. Chocolate! omg I want a bite of this particular Alinea presentation. A silicone table cloth is put over the guests’ table so that the chefs can plate dessert directly onto the table. It starts with milk chocolate mousse put into something like a foam dispenser. With the help of some liquid nitrogen, the mousse is frozen as it is shot out of the dispenser in its foamy state. By the time, the mousse is fully frozen, the table has been plated with various chocolates and sauces. The mousse is them chipped in front of the guests. The texture is crispy and crunchy. As the guests eat, the mousse slowly melts back into its original state and enjoyed that way too. Watching the video clip on this? It was like a dance, a work of art. The setting of the table has been timed to the mousse, and there was nary a pause from the hands of the chefs’ to the point where it was mesmerizing. I wish I could see this action in person. There was a clip about  making raspberry glass (cook down with sugar, add pectin, spread thinly on a sheet, dehydrate, cut out your shapes, dehydrate again, and the final product is quite brittle),  making pineapple/bacon lozenges (I think it was bacon infused cream, treated with tapioca maltodextrin, and shaped into a tablet – the tablet was wrapped in a pineapple sheet made in a similar manner as the raspberry glass. When the guest bites into it, the crispy pineapple gives way to the bacon center which becomes creamy again upon contact with saliva), and  huckleberry/candy cane/cranberry “gum” (ingredients are frozen until they reach a chewy state much like gum – the guest chews it like gum but it eventually melts back into a liquid in the mouth). What else can you find at Alinea? Unconventional ingredients. The first example is pine tree as an ingredient. The essence of pine is captured via rotary evaporator and then used in making something like a sorbet. This pine tree sorbet is served with matsutake mushroom (apparently matsutake has a symbiotic relationship with pine trees), or maybe served with mango. The second example is hay. Grant claims that hay when toasted smells a lot like hazelnuts. So at Alinea, they infused the toasted hay into cream and made a crème brulee (which they have cheekily named “hay brulee”). Same thing with tobacco. Infuse tobacco leaves into cream for a custard. You can serve the custard with peppercorn, blackberry, and mint. But why stop there? Grant has made a stock of apple wood boiled in water. This led the presentation into cocktails. At The Aviary (Alinea’s chef-driven cocktail lounge), they’ve been experimenting with a superchiller would be an alcohol that has been chilled below its freezing point in liquid form, and it becomes slushy has the bottle is tipped out into your glass. There’s a gin+tonic idea that looks an awful lot like bubble tea, but the idea is that the bubbles could be a completely different encapsulated drink to give you a drink within a drink. They’ve been playing with gin+tonic powders and alcoholic pudding. In a nutshell, Alinea sees no reason why cocktails need to be a drink in liquid form. When the cocktail portion was over, Grant talked about color. Does color influence flavor? Will food look more appetizing if it’s plated against complementary colors? One could go as far as to make the service staff change the color of their jackets depending on what is being served. It was a visual idea that I never thought much about. That was pretty much the end of the lecture. The Q&A portion had some pretty interesting questions from the audience. The question I liked best was “You’ve named a lot of thicking agents… What three ingredients should I add to my pantry if I want to start experimenting [with molecular gastronomy]?” Grant’s answer was xanthum gum, carrageenans, and agar agar. After the lecture, Grant was available for book signings. As much as I would like to buy the Alinea cookbook and have him sign it, I’m going to be spending a lot of money in January for my first trip to Europe *cough*tostudyfashionrelatedstuff*cough* so I didn’t plunk down the $43 to buy the book at the signing table. I was of hoping that it would be another lottery system to win the books but, alas and alack, it was not. Oh well. 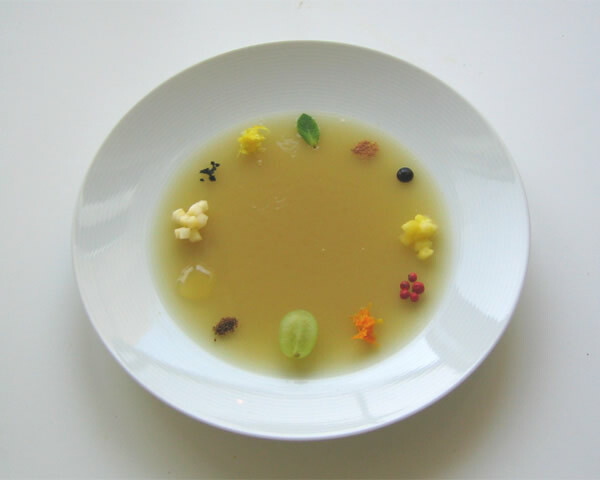 FYI – Grant Achatz had a lot of interesting things to say. So, I’m splitting up this lecture follow up in two or three parts for easier reading. There was something really inspirational about watching clips of the meals that are made at Alinea. Anyway, I knew that I did not want to miss Grant Achatz, founder and chef at Alinea, at last night’s SEAS lecture. Alinea (pronounced as ah-lin-ee-ah), located in Chicago, is some place that I would love, love, LOVE to have a chance to dine at. Like how I would love to dine at El Bulli. However, El Bulli is closed/is closing so that’s one food related destination that I won’t be able to fulfill ever. But dining at Alinea is a more reachable dream as a plane ticket to Chicago is going to be less painful on my savings account than a plane ticket to Spain. I was there with my friend R*. I got to the Science Center first, and she was only a few minutes behind me, but I panicked for a bit there. I didn’t know how big lecture hall B was. R* was amazed at the attendance size. It was 6pm and there were already at least 100 people in line. It turned about the hall B was almost twice the size of hall D, so everyone was able to fit into the room comfortably. Upon entering, everyone got a Le Creuset magnet (Le Creuset is one of the sponsors of the class) and a little take-out box with a little container of some strange, flakey brown stuff and an envelope with some unknown pungent liquid. Lecturer Mike started things off. The upcoming recipe of the week is homemade ricotta cheese. Students have not started this yet as they are studying for exams. The actual topic of the week is “Protein unfolding and coagulation.” Basically, “cooking” food via heat/acidity/salt concentration/sheer forces (whisking). You can poach an egg in vinegar. The recipe example was http://www.epicurious.com/recipes/food/views/Poached-Eggs-236720 (aside: you can try to strip all the ads and comments from the page for a Harvard slideshow but the template format of epicurious is pretty easy recognize if you’ve visited the site enough times). You can heavily salt an egg, let it sit underground, and let it “cook” to get a Century Egg (century eggs were something I could never get into growing up and still can’t). Somewhere in there, Mike also showed us an image of Enric Rovira making a chocolate house for the lab students. And onto Alinea and Grant Achatz! In a phrase? Food pr0n! Seriously. The Alinea intro video was filled with lush images that made you sit up and take notice. As for the rest of the lecture, Grant had split his images into categories and sub-categories. The first topic of discussion? Smell. Flavoring with aroma. Grant gave us visuals first: food skewered on a vanilla bean so that the customer inhales the scent of vanilla as they go to take a bit of food off the “skewer”; cinnamon smoking on a plate served with bison; rosemary which adorns the dining table is moved to a hot brick with lamb so the scent becomes more powerful with the hotter temperatures. As inventive as that all is, the audience quickly learned that Grant likes to go the extra step with his developments. Grant believes that memories can enhance flavor. Case in point – burning oak leaves is a childhood memory of Grant’s while growing up in Michigan. So on top of using fresh ingredients of the season, he might/will use seasonal smells to enhance his dishes. He took oak branches and served them with pheasant, roasted shallot, and apple cider gelee. The oak leaves are torched prior to being served. Then he asked the audience if a tomato tastes more like a tomato in the summer. He expanded the thought with “if you blindfolded someone and served them an heirloom tomato and then a plain old beefsteak tomato with the scent of fresh cut grass, which one will taste better?” It was an interesting thought. We were allowed to pick up our envelope with the clear liquid out of the box and then asked to identify it. It turned out we had concentrated “freshly cut grass” – thank you, rotary evaporator. (The scent was so concentrated that it confused the noses on many audience members. Like another member, I thought it was “pear”… I was wrong but now I’m wondering if anyone has plated pear with freshly cut grass in some form.) At Alinea, there was a dish where the scent of grass was filled into a plastic pillow. The pillow was then punctured a few times with a syringe. When served, the plate of food (it was probably some kind of tomato dish) was placed on top of the pillow, and the weight of the plate slowly pushed the scent of grass out. Next, Grant introduced us to some unusual flavor combinations: 1) Chamomile tea, honey, lemon and striped bass. He sees chamomile tea as an herb and not as a tea. 2) A dessert dish of olive oil ice cream, a pudding made from the brine of olives, an almond cookie, and orange sorbet. 3) Watermelon and aiyu. Aiyu is a Japanese fish and is also known as watermelon fish. Apparently this fish smells like watermelon. So, Grant went ahead and served the two together. One of my favorite parts of the lecture was when Grant explained one of the exercises his kitchen does in order to come up with new dishes – flavor bouncing. Basically, you take your main ingredient, and make a laundry list of ingredients that pair well. You decide which support ingredients you want to use and then make sure that it pairs well with the other support ingredients you want to use. For example, Grant wrote “white beans” in the center of a piece of paper. White beans pairs well with “pancetta/bacon/ham”. What goes with pancetta/bacon/ham? Apples can. Can apples also combine well with white beans? Sure. Maple pairs well with apple, but it also pairs well with bacon and again with white beans. Beer? Ok. It can pair with white beans; it can pair with apple; it can pair with bacon. Maybe mackerel will pairs well with apple, but ham and mackerel, maybe not so leave it out. Eventually, Grant and his staff developed a dish that followed this picture. The main white bean dish was centered on a plate and supporting ingredients were place around like numbers on the face of a watch. You started eating your plate by dipping your spoon in the center and out push out to six o’clock for a supporting ingredient, and take a bite. Dip your spoon in the center and then push out to seven o’clock, and take a bite. Continue until you’ve eaten from all the different supporting ingredients. Coming up next? Texture and unconventional ingredients!